Wheel Dimension Detection. New digital gauge for acquisition of diameter and distance. Maximum precision and smoothness with integrated FSP (Fast Selection Program) function which automatically activates the balancing programs, avoiding keypad selection. LED light illuminates the work area to facilitate rim cleaning and application of the counterweights. Application of adhesive counterweights. The adhesive counter weights can be positioned extremely rapidly using the laser pointer at 6 o’clock (LPS, laser pointer system) or by using the weight tray clip. the wheel dimension acquisition phase extremely rapid. Every program for the professional. a click to directly access each program. AWC – Auto Width Calculation. Reduced wheel data entry times thanks to the AWC function which suggests the most probable width value (in the absence of the AWD measuring sensor). of counterweights used, increasing the economic benefits and environmental protection. different types of counterweights and tool positioning. Designed to allow positioning of the wheel balancer against the wall and to accommodate wheels with diameter of up to 44” (1118 mm). Optional “Weightless effect” wheel lifter. Predisposed for direct connection to the new TT-0 wheel lifter which eliminates operator effort, speeds up routine operations and ensures perfect centring thanks to the self-balancing function. and wheel centring and locking kit 42-118,5 mm. Versatile and compact with extraordinary performance. Fully automatic cycle, electric clamping brake and position search function at end of spin. Comprehensive, intuitive graphic interface. 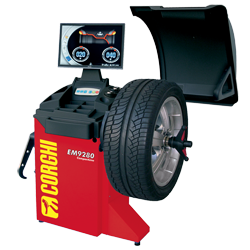 Digital measuring sensor for wheels up to 28”. 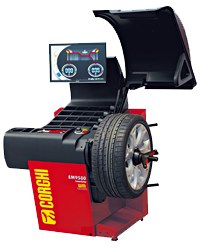 The perfect balance between price and performance for the wheel service professional.